Android’s rise and rise has been emphatic, and now new research shows that it truly is the king of the smartphone operating systems, commanding a immense 81% of the global market. Figures from the International Data Corp (IDC) report that 4 out of 5 smartphones are powered by Android, with around 211.6 million Android smartphones being shipped in the third quarter this year. 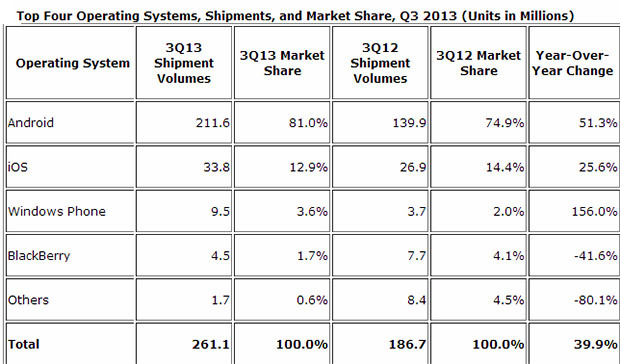 Android bagged an astonishing 51% year-on-year increase in market share, while Apple dropped from 14.4% to 12.2 %. Sadly, it’s a very different tale for the beleaguered Blackberry, which saw its already decimated 4.1% share crash to just 1.7%.